STANFORD, Calif. — Shannon Coffee wanted to learn sign language in high school back home in Ohio, yet the timing never worked out and she focused first on getting through her Spanish studies as her mom suggested. 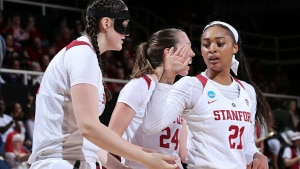 Sign her up: Stanford’s Shannon Coffee isn’t deaf, but she does sign language during the national anthem before games. Coffee’s contributions to Stanford may go under the radar — she has two career starts, both last season, and averaged 1.5 points and 1.5 rebounds as a senior — compared to the stars who play far more minutes and pile up impressive statistics. Though at 6-5 and wearing a black mask in games to protect her nose after injuring it during a December practice, you can’t miss Coffee when VanDerveer calls on her for key minutes off the bench. Coffee also is one of those high-achieving Stanford students who makes your jaw drop: A human biology major, she spent last summer interning with the Stanford Center for Clinical Research. There, she worked on a concussion study with research and data collection, a project involving mouth guards developed by Stanford engineers.